After the wettest footy season many of us can remember the WAFL finals kicked off under a glorious blue sky at Fremantle Oval on Saturday. The Bulldogs burst out of the blocks and kicked the first five goals before the Falcons steadied, put the pressure on, started winning the clearances and clawed back into the game. 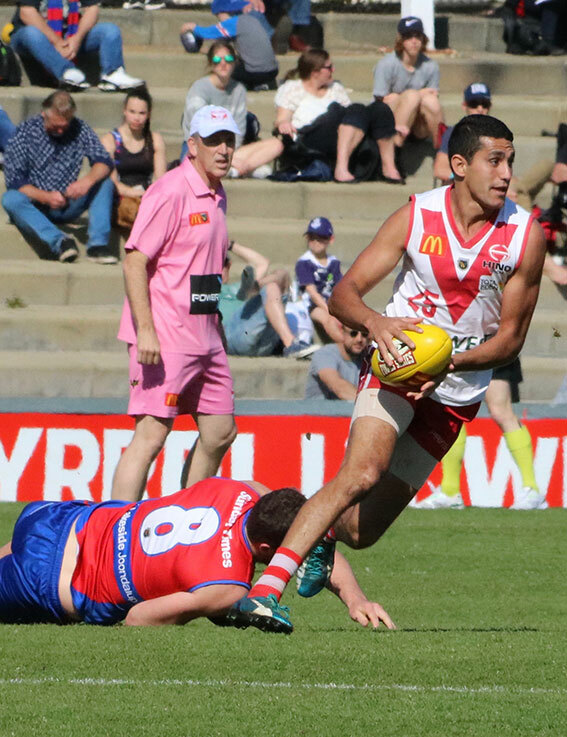 Two late goals gave South Fremantle an 18-point lead at half time but the game looked tight. Marlion Pickett heads out of defence. Ben Saunders marks on the lead. 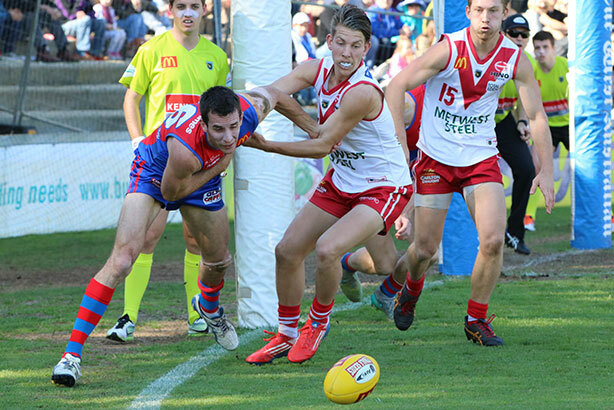 The Bulldogs got off to a flying start in the second half kicking towards the prison end but this time they blew West Perth away – they kicked 7.7 to 1.1 and the lead at the last break was 60 points. 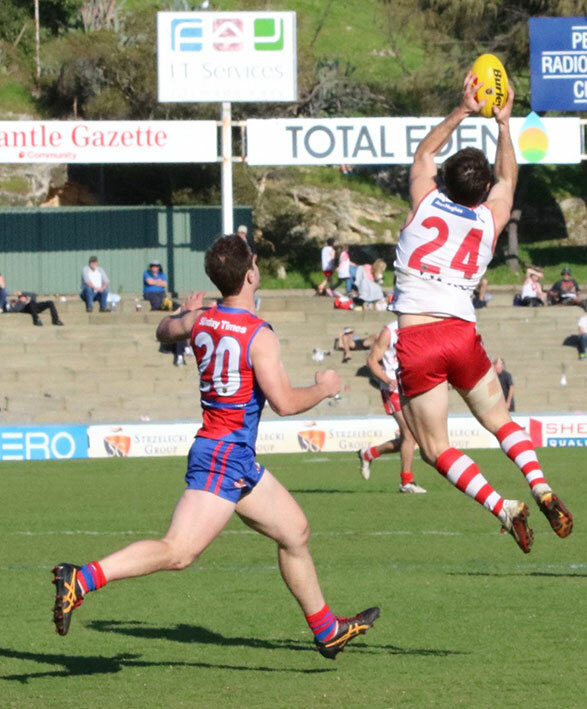 South Fremantle’s potent forward line was well suited to the conditions. Mason Shaw kicked four goals and was often the link man, Ben Saunders also got four and his chasing and tackling were outstanding, while Blaine Wilson kicked three goals. Ashton Hams, who was busy and effective in the midfield, also kicked three goals. Marlion Pickett’s speed and use of the ball coming out of defence was hard for the Falcons to handle while Dylan Main, Tim Kelly and Brendan Verrier were dynamic in the midfield. It was a difficult day for West Perth – their pressure was good for a while but there was little fluency in the performance. Luke Meadows did his best in defence, Steven Browne was lively in the midfield, Shane Nelson worked hard, Trent Manzone tried to spark things and Michael Lourey kicked three goals. 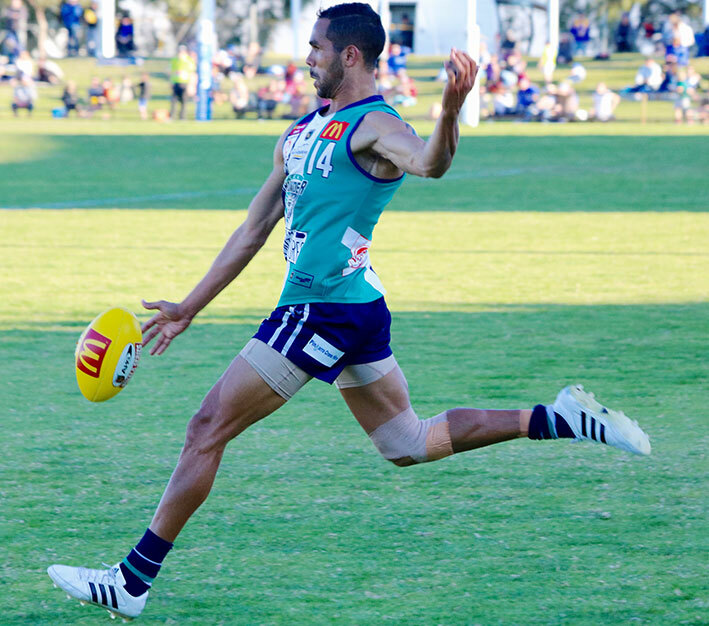 Shane Yarran kicked three goals for Peel. The skies were blue at Rushton Park too but a stiff breeze made things difficult, especially in the first half. One of the many issues for Fremantle in the AFL this year was a lack of marking power – there were 17 Dockers in the Peel line-up on Sunday and the marking of Michael Apeness in attack, Alex Silvagni and Sam Collins in defence and Zac Clarke around the ground was one of the big advantages Thunder had over East Perth. The ruck contest was also significant with East Perth’s Paul Johnson, in his last game, on top early but he lacked support and Clarke and Jack Hannath gradually took over. The Royals did well into the breeze in the third quarter kicking two goals to Peel’s one to reduce the margin to 22 points at the last break and the game looked to be in the balance. The breeze wasn’t so significant in the last quarter but East Perth’s run had finished anyway – Thunder scored 4.3 (27) to nothing to the delight of the success starved home crowd. The story of the first half. A strong mark by Michael Apeness. Matt De Boer did the heavy work in the midfield for Peel, Connor Blakley and Darcy Tucker used the ball well, Shane Yarran kicked three goals and was a constant headache for the Royals defenders, Nic Suban, Tendai Mzungu and Gerard Ugle were lively and Ethan Hughes got into the right spots in the back line. Callum Hart was impressive for East Perth, William Macinness looked classy and kicked two goals, Malcolm Karpeny was constructive, defender Tom Gorter showed composure in the defence and Craig Wulff, also in his last game, was highly competitive in attack. Peel came into the WAFL in 1997, this was their first finals victory in the league competition. 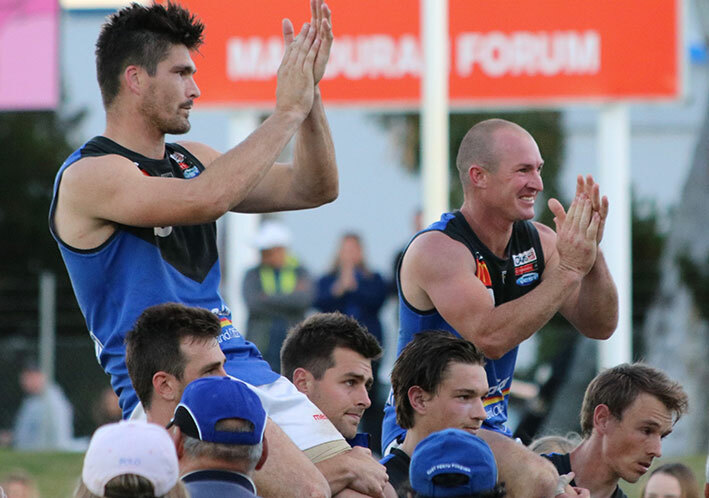 Both teams stayed on the field to farewell East Perth greats Paul Johnson & Craig Wulff. By the way the first semi is at Joondalup and second at Leederville. I was subconsciously linking West Perth & Leederville… just like the old days. As we both said at the time, our Eagles and Dockers have managed to stuff up all the traditional connections in the WAFL. Still a great comp for developing young players but oldies like us are positively schizophrenic now. 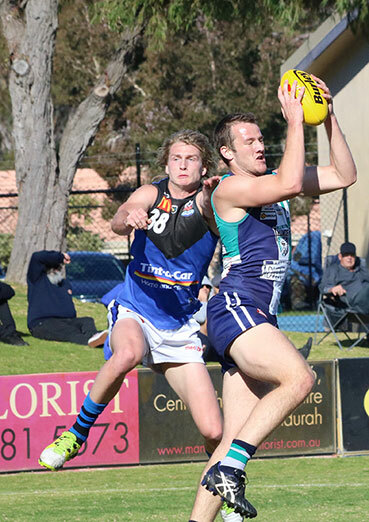 Did you barrack for the Peel Dockers players or the East Perth Eagles jumper on Sunday? RIP Franky. A true legend of WA Footy. Do you have a picture of Pav and Franky for the Almanac cover? Is there a Franky obit coming? I understand if you are still grieving. Having done Clarence Clemons, Muhammad Ali and Nelson Mandela for the Almanac I may be able to give Shandy a hand with a piece about a respected foe. Sadly I supported Peel on Sunday. And yet I admire Craig Wulff and Paul Johnson. Go Dogs! Now for Subi. Tough ask, but done it before.